Purchasing a guitar is a lot like purchasing an automobile. Some people just have to have a four wheel drive. Others have to have a particular make or colour. Some people look at how well the automobile is built and whether or not it can be easily fixed. For others the vehicle must cost more than what their friends have paid for their vehicles. Like automobiles guitars come in such variety that your possible choices can be staggering. This page will give you some of my thoughts on what is available. The "WOW Factor" is something that parents or guardians should also keep in the back of their minds. The "WOW Factor" can be defined as how cool the student thinks their guitar is. Will your student or you happily pull the guitar out to play? Will the guitar be cool in the eyes of friends? I offer my support in picking out a guitar and the necessary accessories. Almost 200 customers have taken the time to write comments about this guitar and it's rating is just over 4 from 5 points. The guitar costs 65 Euro. The scale or scale length is 52 cms. This guitar size is suitable for person's that are approximetly 1,2m tall. The guitar is good for it's price and a demo is available here at English with Music to try out. If the student is just a little bigger I would likely consider a Fender ESC80 Educational 3/4 NT. The name Fender just adds a heap of "WOW". The guitars are both classical style guitars with a mix of nylon and steel strings. In their price range they are amoung the easiest guitars to play because of the nylon strings. The Thomann classic guitar does not come with strap pins so I would plan on picking up a set of pins and a strap. In my course I sometimes encourage students to be able to move with their guitar and play at the same time. Building confidence is also one of our aims. When I order the next student guitars in this size I will do a direct comparison of the two guitars. This is a full sized western guitar and although the name western is used, all types of popular acoustic music can be played with it. Since it has all steel strings, playing it can take a little more pressure than a concert guitar. The sound from a steel stringed guitar will be closer to that of what you hear in most popular music than a concert guitar. This guitar is available for students to try out. Cutaways allow the player to play further up the neck and pickups alow the guitar's sound to be amplified. From Thomann I will be soon investigating a Fender Squier SA-105CE BK. This is a beginners guitar having a cutaway and active pickup. With a bag and strap it costs around 130 €. Like automobiles prices and choices are endless. If you are just starting out I would recommend limiting your budget and gaining some experience first. The Fender Squier guitar mentioned above should be easy to resell when you should want to replace it. A Fender model without a cutaway and pickup that has top ratings is a Fender CF-60 NA. Loud or quiet, you choose! Talk about "WOW" factor. This 3/4 size electric guitar gets both top and poor ratings if you look around but more about it's advantages and disadvantages. With an electric guitar you can practice very quietly. When I was teaching IT and staying often in hotels, I learned to not bring a guitar case into the reception area until I had my room. An acoustic guitar is louder than you may imagine so I traveled mostly with my electric. If you want to learn bare chords and scales an electric guitar can make your path a lot easier. One of my friends plays bare chords well on his acoustic and prefers the sound but he does admit it is a lot more challenging than playing on an electric. An electric guitar will need to be amplified if playing with others or if playing in a noisy environment meaning extra cost. Decent playable electrics start with the 3/4 size. The electric guitars in this size will be heavier than acoustic guitars. This demo guitar is available to try in my music room. A complete kit (Ibanez GRGM21GB-BKN Mic Bundle) is available for 240 €. This kit includes guitar, amplifier, cable, and tuner. For 9.50 € what can you expect. Well it is surprising. This is a back lit tuner and metronome in one. At first I thought this unit must be really just a toy but I have changed my mind. 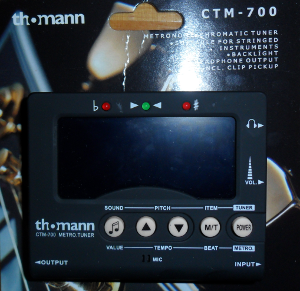 With an average rating of over 4 and a half stars almost 800 customers have rated this tuner. It's accuracy is not bad. Only the "B" string indication varies from my other tuners but the variation is slight. For beginners the indicator is somewhat dampened and easier to read than others I have. The metronome works well and there is a jack for earbuds or headphones. The circuitry is far too noisy to use the tuner inline so you will not likely find these units on stage. For it's cost this is definitely a good deal for beginning guitar players.